Location: 425 6th Ave. South, Birmingham, Ala. 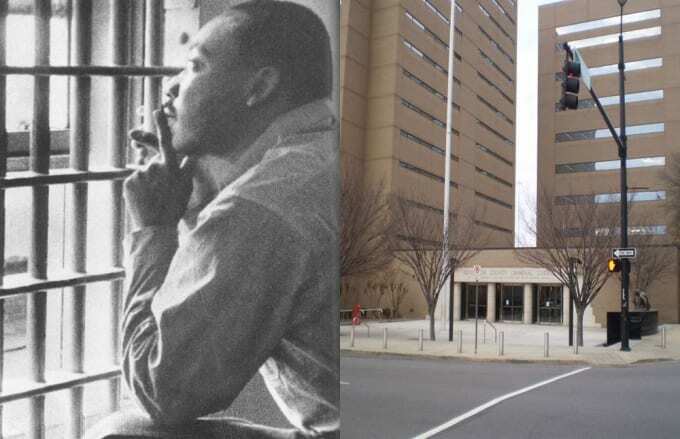 Confined to a cell in this building, Dr. Martin Luther King, Jr. penned the "Letter From Birmingham Jail" on April 16, 1963. King was arrested and imprisoned for his participation in the Birmingham campaign, a non-violent protest organized by the Alabama Christian Movement for Human Rights and the Southern Christian Leadership Conference (SCLC) against the segregation propagated by Birmingham's government and retailers. Birmingham City Jail still stands to this day, and now a black woman—Chief Kathy Davis—presides over it.